Leonard Bigbie, center, with granddaughter-in-law Genny Bigbie, left, grandson Michael Bigbie and son Joe Bigbie. Leonard Bigbie as a Pittsburg Steeler. As the New Orleans Saints were dueling it out on the Superdome field Sunday in one of the most exciting NFL games of the season, a former Laurel businessman with deep roots in the community was being treated like royalty. Leonard Bigbie was born in East Texas, but found his way to Laurel and owned Big B Valve & Repair Service, which was located on Highway 15 North across the highway from Chris Posey’s car dealership. The business was well-known for its Oilfield Christmas Tree display until he retired and closed the business in 1999, wrote his daughter-in-law Ellen Bigbie. 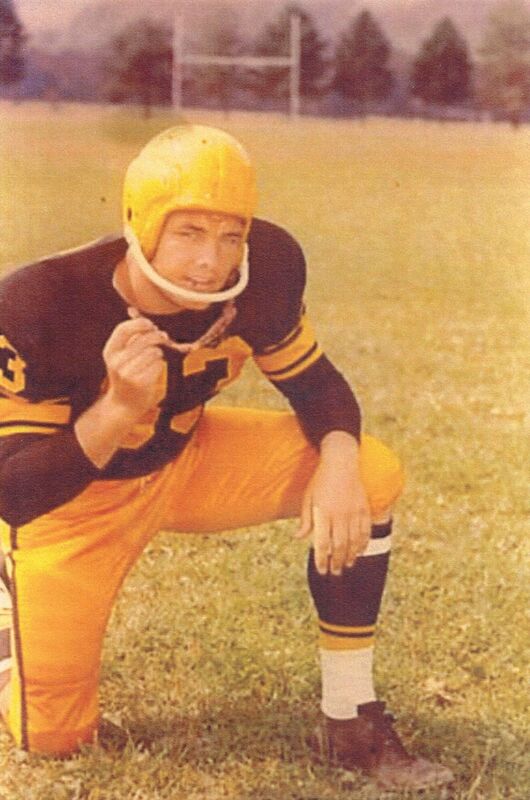 But before he opened his business in Laurel, he was a star football player drafted by the Pittsburgh Steelers in 1957. He played in eight preseason games before the Steelers hired a new coach who brought in his own linemen, one of whom replaced Leonard. With the exception of those games in which he played, Leonard Bigbie never saw the Steelers play — until Sunday. 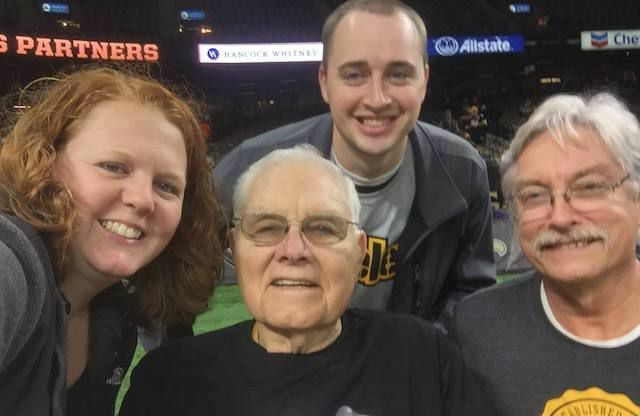 His family got tickets in June and as the game got closer, they reached out to the Steelers and the team responded with special sideline passes that allowed the family on the field for two hours before the game. He attended the game with his son Joe, grandson Michael and his wife Genny. The following interview was conducted by his granddaughter Bethany Byrd. Q: What are your vivid memories from your first training camp in 1957? A: This place (Olean, N.Y.) is a long ways from my hometown in East Texas. I didn’t know anybody and I was a loner. My sole object was to make the roster. My roommate was a young feller, I can’t remember his name. He was from Bloomington, Ill. I was in a different world. We stayed at St. Bonaventure University. That’s where the training camp took place. Q: If you were cut, who told you, how did they do it or phrase it? A: The head coach, Buddy Parker. I was the 15th draft pick and the last cut from the team after Buddy Parker, a former head coach for the Detroit Lions, and Walt Kiesling’s replacement, brought in another lineman. He kept that lineman and turned me loose. It was very disappointing, especially after I had played all of the preseason games. I played enough in all of the games that I should have made the roster. Q: What was your greatest memory from a game or practice? A: My greatest memory from a total of about eight preseason games was when I played defensive end against the Detroit Lions and was faced up with a player named Louie Creekmur. During that game, he elbowed me in the face and rattled my brain. That’s all it took, from then on, I brought my elbow into his head and stomped him into the ground, went over him and made four individual tackles in backfield. I remember that well. Another memory was when we flew to Jacksonville, Fla., and played the Chicago Bears and were met at the airport with about a dozen convertibles. We all, the whole team, piled into the convertibles and drove around town to advertise that we were going to have a big game tonight. They beat us. After the game, on our way back to Pittsburgh, I sat next to Mr. (Art) Rooney, who was the owner of the Pittsburgh Steelers, and yacked with him. At the Bears game, I met a man that was an acquaintance of my father-in-law by the name of Jim Strickland. He couldn’t believe it. We had a long conversation walking off the field. Q: What numbers did you wear? Do you have any emotional attachment? A: My number was 83. I don’t have any emotional attachment to the number. In college, I played tackle and was 72. Q: Who was your favorite Steeler teammate? A: I didn’t have any favorites, but the ones I best remember went on to be news announcers for the NFL — Lenny Dawson, the No. 1 draft choice for our team, and Ted Marchibroda. Q: Who was your Steelers’ roommate? A: I don’t remember who my roommate was. Q: What is your greatest college memory? A: Playing as starting tackle for East Texas State University, which is now Texas A&M. The best memory from that time was that I was able to go to school on a football scholarship. I also played for Kilgore Junior College for two years. Q: What would you like people to know or remember about you? A: I never in my wildest dreams ever thought that I could go from a small settlement in East Texas to playing professional football and owning a company with 100 employees. I don’t know if you’d call it luck or just being bullheaded enough to do it. I wouldn’t want them to remember me as a slugger when we played Detroit, but he brought it on. I just finished it up. That I was loyal to my church as a deacon and as property committee chairman. I give God the glory for this. I served as tournament director of the 1977 Mississippi Oilmen’s Invitational Golf Tournament. Q: What teams do you root for now? A: I root for the Steelers first and the Saints second due to their location being a little over a 100 miles from me. Q: Did you have a nickname during your playing days? A: Yes, Len. You’ll find information for me under the name “Len Bigbee.” My last name was usually misspelled with two E’s. A: Also — I now have two children, eight grandchildren and 10 great-grandchildren. I’ve been married to the same woman, Ann, for 59 years and looking for 59 more. Interview was conducted by Leonard’s granddaughter Bethany Bigbie Byrd in 2013 for a man who was writing a book on the Steelers’ drafts.